I started my 30-baseball-park geas with Kansas City, which definitely fits the model of saving the best for last. Inauspicious beginning? I'm not bothered. It takes a certain kind of ball club to drop 10 games in a row. Since Wednesday's loss the Royals have dropped yet two more games, making them a very certain kind of ball club. Plus, what did I expect for my—wait for it—first American League game ever. Yes, that's right, I've never seen a designated hitter before, in person. Odd sort of creature, I must say. I'm in San Francisco now, and yes, my dad and I are going to a Giants game. They're in 3rd place, playing the 4th-place Padres, so it may be a closely-fought match. I'm looking forward to it. One more rule I forgot to mention: eat locally. And in KC, that means barbecue. 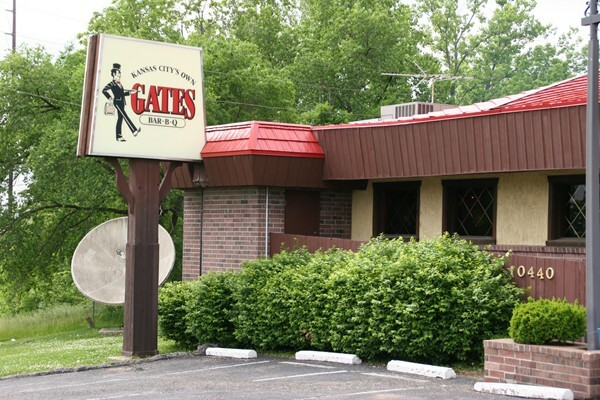 Tonight I went to the Gates BBQ, in Independence, Mo., as reccomended by the hotel's driver, Martin. Interesting. The pit-fired meat fell right off the bone, with a crunchy outer shell from the intense heat they use. The sauce, though. Hmmm. It wasn't what I expected. I always associated KC-style ribs with a sweet-tangy, tomato-based sauce. Gates uses a tomato base but their sauce has more heat and less sweet, almost like a Memphis-style barbecue. Plus, the meat seemed awfully salty. So, not the best ribs I've ever had—those would be the ones my brother and stepmother make as a team—but not too disappointing. Almost forgot, I drank locally, too, having a Boulevard Pale Ale with dinner. Good clean finish, light flavor, decent beer. This one I'll have again. Follow-up, 6:15 pm: I just had an enlightening conversation in the hotel gift shop*. It seems that there are two different cultures in Kansas City, and Gates BBQ belongs firmly to one of them. I'm proceeding delicately here because I think I'm a little offended, and I don't want to offend anyone else. Apparently, those in Kansas City who look more like me than Martin does avoid Gates because, well, it's not their style of BBQ on the one hand, and on the other, it's still 1958. * Despite planning to have ribs for dinner, I neglected to pack dental floss. I have a little time before I go off in search of a slab of ribs to explain why I'm in Kansas City. One of my friends decries people who say "I've always wanted to [insert relatively accessible activity here]..." but who haven't actually done [activity]. For example, on more than one inauspicious first date the guy has said, "You lived in Europe? I've always wanted to go there!" Since she's dating single men who are over 30 and over the poverty line, "always wanted" is obviously not true, becuase they would have gone already. To honor that, I will say I've not always wanted to see a baseball game in every major-league (and American League ;) park—but I've always mused about it. Spend as little as possible on the quest. This means, among other things, bunching games up geographically and looking for the cheapest airfares available. In any park other than U.S. Cellular Field, if the Cubs are not playing, root for the home team. In any park where the Cubs are not playing, when a hat must be worn, wear a Cubs hat to American League parks and a Red Sox hat to National League parks, on the theory that the hat would therefore be neutral. If the Cubs are playing, wear a Cubs hat and root for the Cubs, obviously. Which brings me back to Kansas City. I'm here because I had a previously-scheduled trip to San Francisco anyway, and this was the least-expensive option. Photos to follow. Now, I'm going to get some sizzlin' baby backs. It has been 102 years since both teams were in the playoffs at the same time, with the White Sox winning the only all-Chicago World Series in 1906. If the Cubs hold off St. Louis for another few days, this could be the first time in 31 seasons the Cubs and White Sox have both been in first place at the end of May. This, however, might not be the greatest harbinger of good times. The "South Side Hit Men" Sox slid to a third-place finish, 12 games behind division winner Kansas City that 1977 season, while the Cubs finished 81-81 and in fourth place. Funny that mention of Kansas City: I'm going to Kauffman Stadium tonight on my way to California. The Royals, sadly, are tied for last place, having dropped their last nine in a row. I anticipate a riveting evening of baseball. I just brought Parker in from his evening walk. The temperature has just dropped, no kidding, 10°C in the past ten minutes. It's such a sudden shift none of the weather sites has caught up, though there was a hint: at 10pm, the temperature in Waukegan (60 km north) was 11°C, but 25°C at Midway (18 km south). My first clue was the wind going from dead calm to 36 km/h in an instant. What does one say when he runs into his first-year high school French teacher nearly 25 years later? At a bar? The best I could come up with: "Madame, je me souviens le français!" To which she replied: "What's your name again?" In English. Consultant Marty Stern of U.S. Equities Realty says, in a report to be presented to the city's Economic Development Committee Wednesday night, that nine different generally suitable Class B buildings have a total of 50,072 square feet of vacant space.... In addition, Stern says there is about 141,000 square feet of more expensive Class A space available downtown and 21,000 square feet of less expensive Class C space, most of it downtown. That comes to 19,700 m²—almost five acres of office space. Slightly more than we needed, of course, but probably workable. I'm kicking myself for not riding Bike the Drive this morning. That's the annual, Memorial Day weekend closing of Lake Shore Drive in Chicago, all 30 km of it, for any bicyclist who ponies up the fee. I'm kicking myself because it's 19°C and sunny with a good breeze out of the South. Good biking weather. I'm taking a summer vacation this year for the first time since 1992, and I had planned to load Parker and his smelly blanket into my Volkswagen and drive to San Francisco with him. Only, I just filled up my car this morning, and for the first time ever I crested $50. For gasoline. In my bleeding Volkswagen. Which caused me to whip out a spreadsheet and determine conclusively whether driving with Parker out to California makes any sense at all. In fairness to the car, (a) this is Chicago, home of the highest gasoline prices in the country, and (b) the car, a GTI, has a high-compression engine that requires premium gas. But premium gas is only 20¢ more per gallon than regular, as it's always been, so that is no longer the differential expense it used to be. Now the difference is $553, almost half the cost of the trip. And it gets even better if you consider that I have a big wad of unused frequent-flyer miles that can, if I choose, bring the airfare down to $5. Yes, five dollars (plus 25,000 air miles), making the difference between driving and flying $828—enough to do the trip again by air and still save significant cash over driving. I could take him in an airplane, but this really stresses dogs out, so I don't consider that a realistic option. In any event, as fun as it might be to watch Parker run along a beach in California, it's just not going to happen.